Old photographs can take us from today’s time and fashions into a world of long ago. 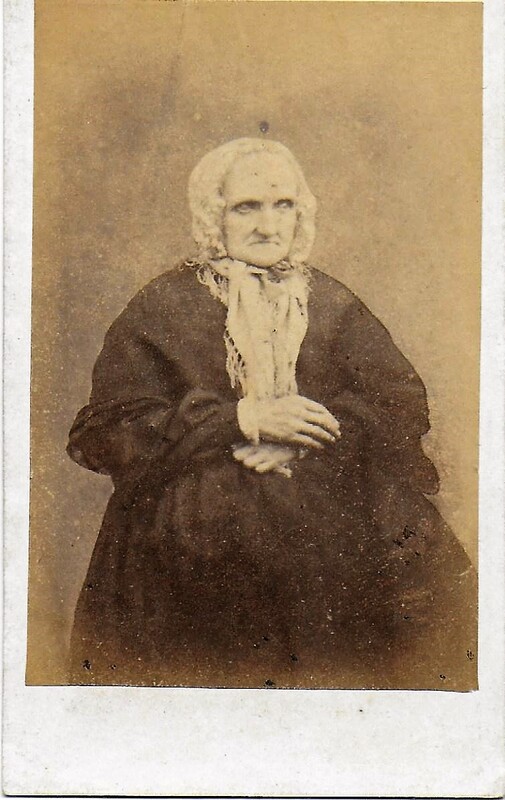 How fortunate we are to have actual representations of our loved ones begining around 1842. But the process was expensive. 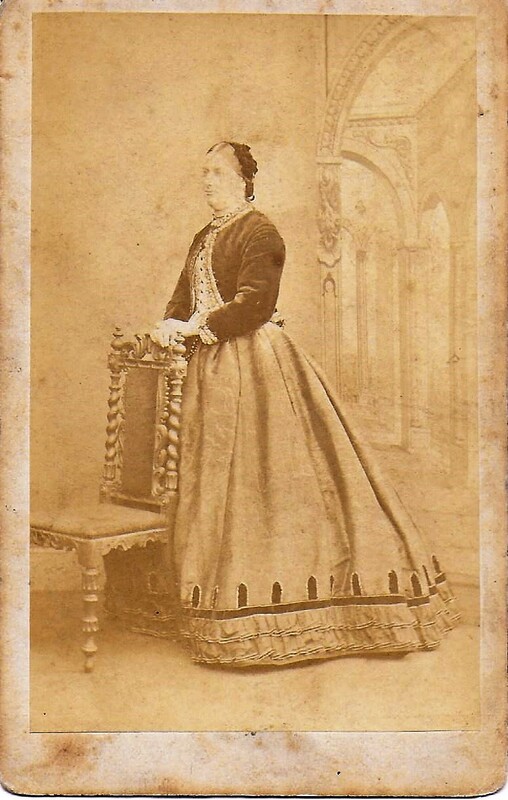 By 1860 the carte-de-visite was introduced – a photograph taken and put on a rigid card. This was much less expensive than the original daguerreotypes, ambrotypes and tintypes – and they were not as fragile. This was the beginning of our love of photography. Today I have chosen seven photographs of women wearing hats. Let’s take a journey from about 1860 to 1912. Don’t you love this photo? This little old woman seems very fragile. Probably taken before the Civil War began, she wears the typical dress of a widow – with the exception of her lighter colored lace collar. 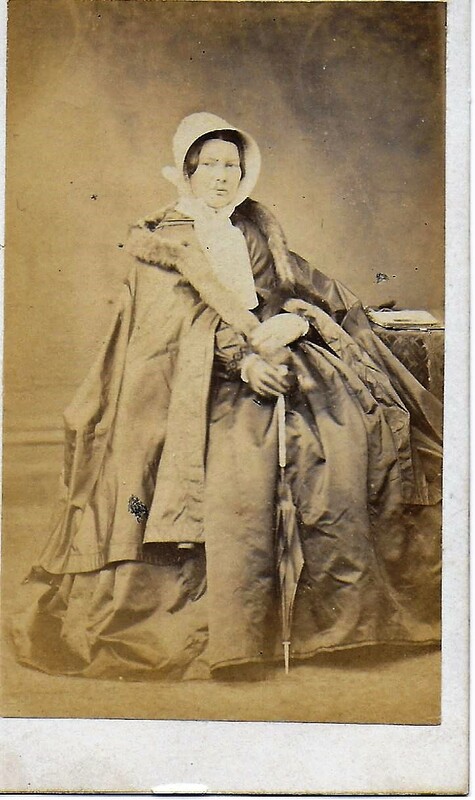 It is hard to see the ruffled bonnet she is wearing, but the ribbons are tied under her chin. Since there are no borders on this card it is dated 1858-1863. Our second photo is of a similar date, no borders, and look at the huge skirt with hoops underneath. With her cloak fur trimmed and her parasol, she is most likely a well-to-do woman. This woman’s bonnet is easily seen – it fits close to her head in back and has a wide band that encircles her face. 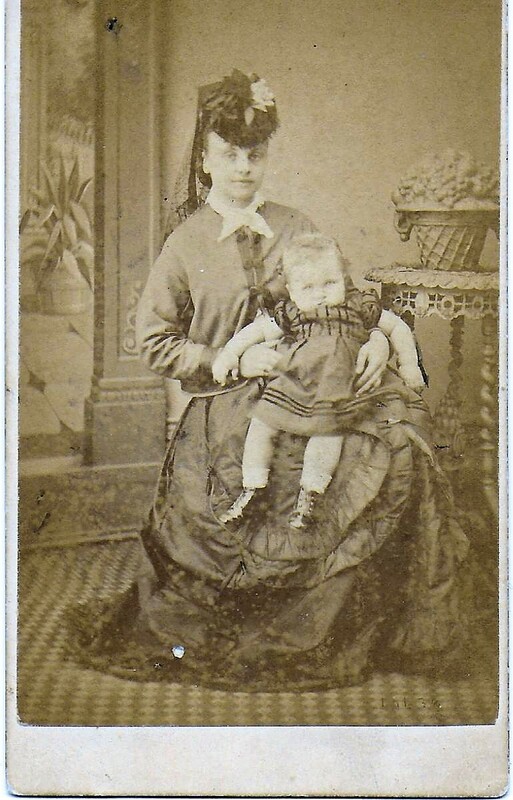 The next photo, even though there are no borders, is definitely from the about 1863-1865. Her dress has ruffles and decorations, the bolero jacket is from that time period, and the skirt, while still large, is not quite as voluminous as at the beginning of the decade. She wears a small hat, perched on the back of her head. The 1870’s saw the most dramatic change in women’s dresses than ever before. The bustle caused the back to protrude, and because of this the sides of the skirt were drawn closer to the woman’s body. Do you notice this woman’s pocket? Her gloves, or perhaps a handkerchief, peek out. She has a fur muff – for looks or warmth or both? 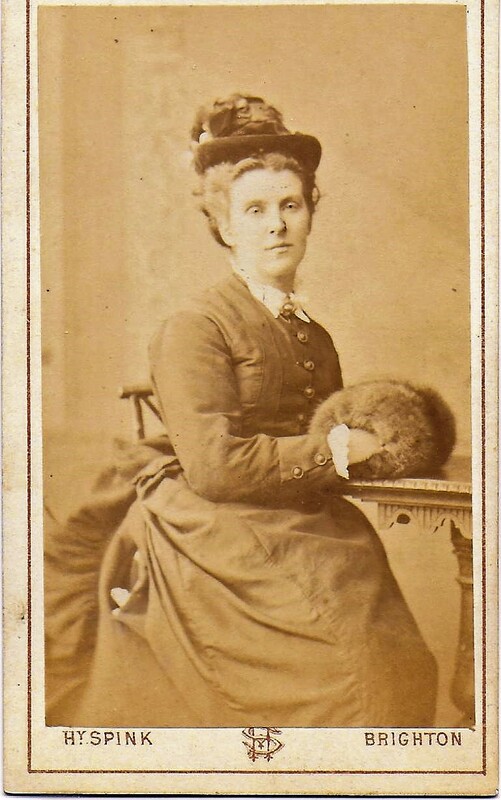 The small hat on her head is indicative of the 1870’s – as is the more soft look of her hairstyle. The early 1880’s brought a more elaborate front to the dress with many ruffles and decorations. This woman wears a hat, pulled towards the front, with netting and ribbons falling down the back. Her jacket seems a bit large, they were generally more form-fitting. But with the baby on her lap it could be left over from her pregnancy. Don’t you love this photo! This foursome must have had a wonderful day. This unique photo is 3 3/4″ x 3 3/4″. Notice the texture around the edge of the card, and the scalloped edges. 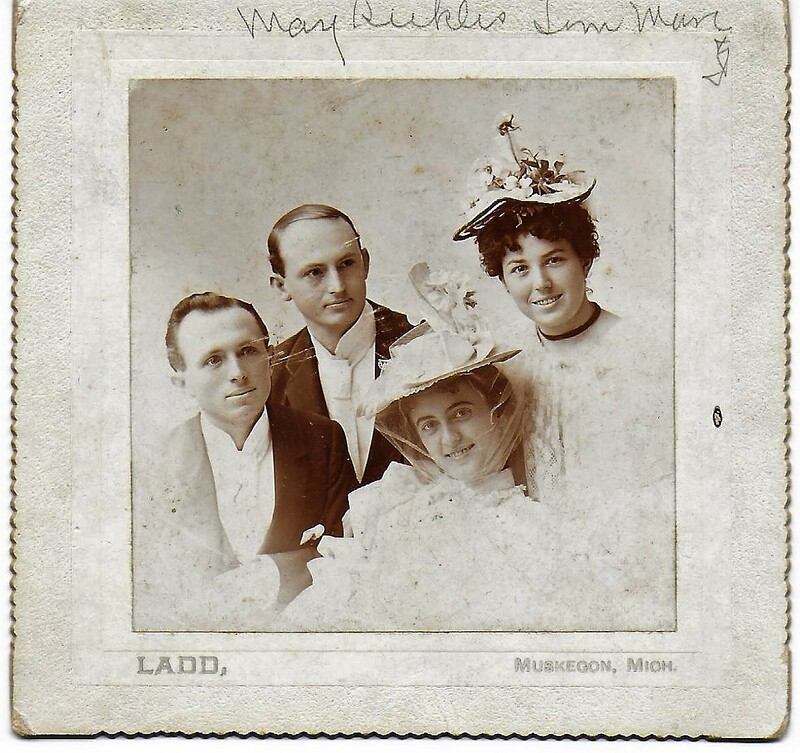 This card dates from the mid to the late 1890’s. 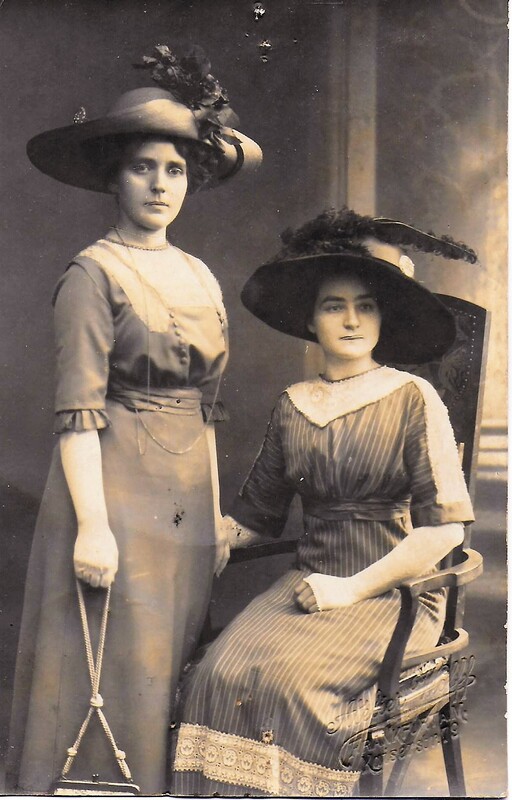 The two ladies’ hats are very similar, one wrapped in tulle. Handsome gents and lovely ladies. This dramatic photo is easy to date – it is a postcard and was send from Frankfurt, Germany, September 22, 1912. This is the era of lovely, trim fashions, long gloves (some fingerless) and gorgeous, large hats. I hope you’ve enjoyed our journey through fifty years of fashions.